In 2018, the W Awards enter into their second decade of contact with the w-friends, which now enter their 11th Edition. Through w-anibal.com and the new blog.w-anibal.com, these awards, designed as simple retribution to the wine sector, which welcomed and encouraged the author so much, have been growing in size and visibility and are already a reference in the wine sector. 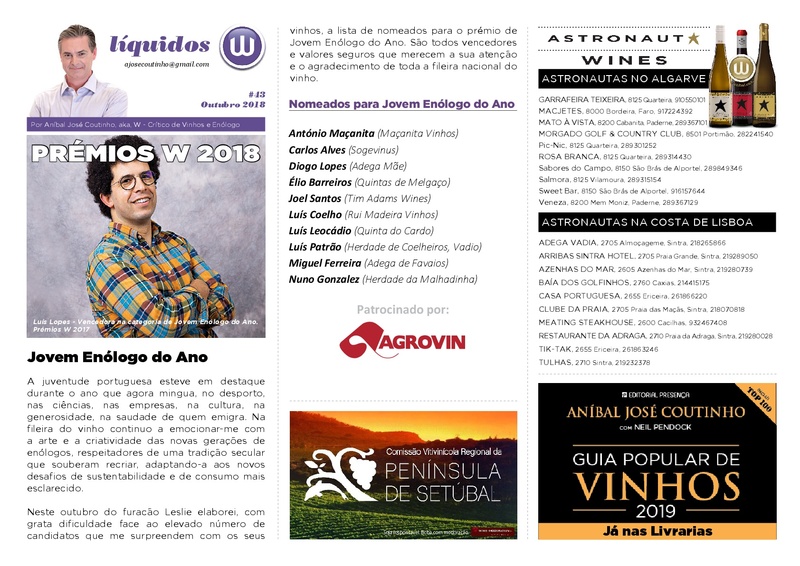 At the beginning of each year, Aníbal Coutinho, initiates an exhaustive investigation, that takes him to travel thousands of kilometers throughout the country, about the best references related to the world of wine that he calls W-Spots, which are published weekly Liquid W Bulletin, which is distributed to about 30,000 friends. This research is the embryo for the appointment of 10 appointed, in the current 32 categories, and consequently, in the various winners that will be revealed in January next year. A special thank you from the author to all the brands, that throughout these years, has supported this and other projects of the wine critic and oenologist.